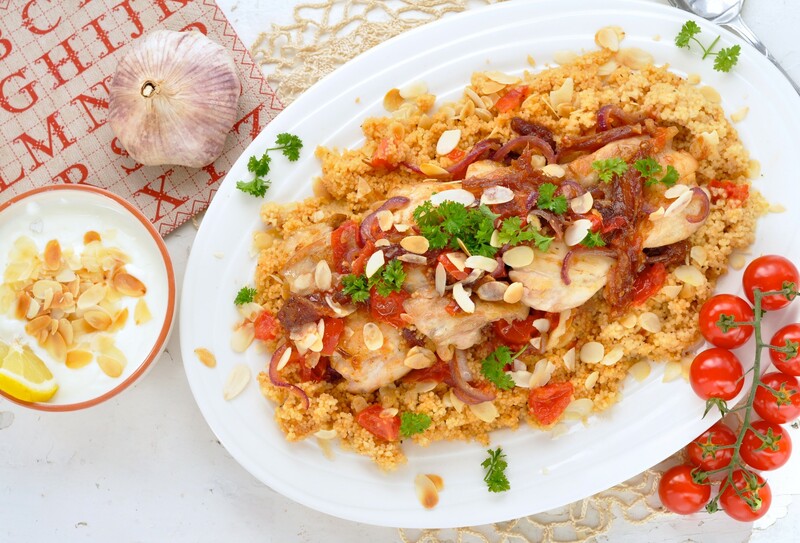 Couscus with chicken and medjoul dates - Mehadrin Tnuport Export L.P.
1.Pel the onions and garlic, cut the onions into thin strips (or small pieces to taste). 2.Cut the dates in half, take the pit out and cut the dates into thin slices. 3.Put the frying pan on the stove and heat the butter and 1 tablespoon oil over medium heat. Cut the chicken thighs fillet into three equal pieces and place in the pan when the butter and oil are well melted / heated. Fry the chicken on each side for about 2 minutes until tender. Place chicken pieces on a plate. 4.Leave the Chicken pot stand over medium heat. Crush the garlic and place it with the chopped onion and 1 teaspoon salt to the pan, stir fry cooked in about 5mins. Add the cumin, ground cinnamon and saffron to the onion mixture, stir fry for about 1 minute or until it starts to smell nice. 5. Put the chicken with tomato, chicken broth, cinnamon stick and half of the dates in the pan. Bring to the boil and let it simmer with the lid for about 15 minutes (or until the chicken is cooked through).